Reuben Stuffed Matzo Balls - Kosher In The Kitch! 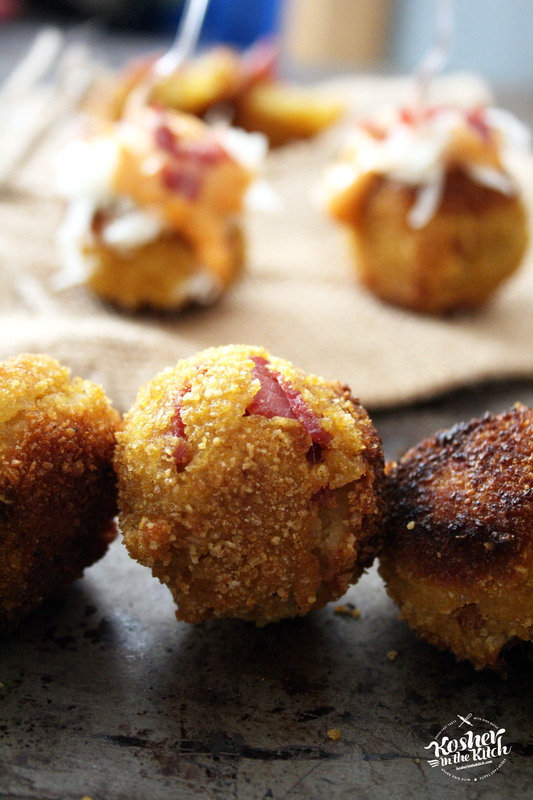 Reuben Stuffed Matzo Balls - Kosher In The Kitch! Hello new Jewish year! This is the first Kosher in the Kitch recipe of the Jewish year 5777 and I am so excited to share it with you! I have been working with Lipton Kosher to bring you exciting new ways to eat traditional Jewish foods, such as Matzo Ball Crusted Chicken Pot Pie and Stuffed Falafel Balls. 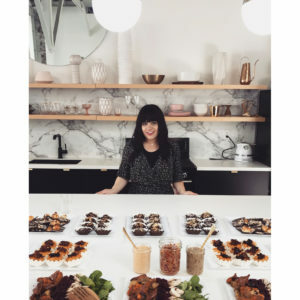 I love giving recipes a Kosher in the Kitch makeover. 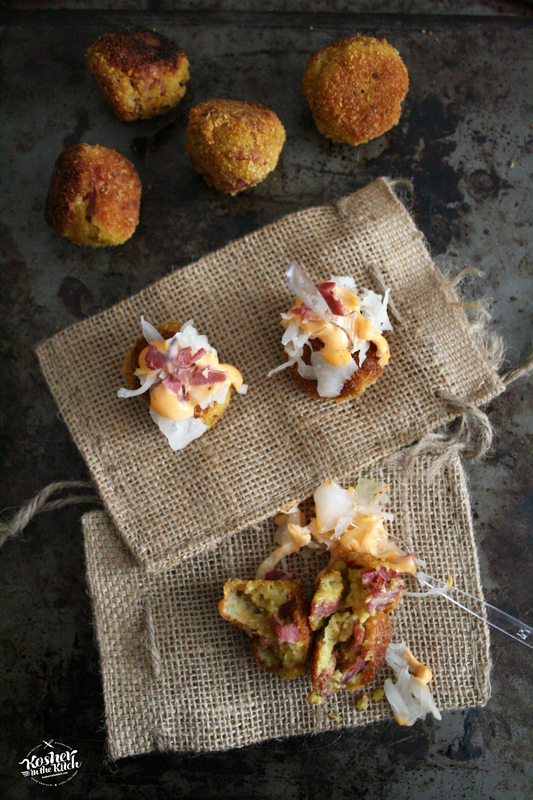 The latest fun and tasty mashup in the kitch are these easy to prep and delicious to serve Reuben Stuffed Matzo Balls! In this dish matzo balls are stuffed with chopped corned beef, dipped in eggs then coated with corn flake crumbs and fried until golden and crispy. Topped with kraut, Russian dressing and a few extra bits of corned beef these matzo balls are the perfect appetizer or side dish when entertaining. Serve them on Shabbat, Sukkot, Purim, over Hanukkah or any meal you want to impress your guests. Prepare matzo balls by blending 4 eggs and 2 tablespoon vegetable oil in a large sized bowl. Add both packets of matzo ball mix and stir with fork until well combined. Refrigerate for 10 minutes. Slice corned beef into small pieces. Reserve 1/4 cup corned beef and thinly dice for garnish. Combine remaining corned beef with matzo ball mixture. Using a small cookie scooper, scoop out matzo balls and using wet hands roll mixture to form small balls. 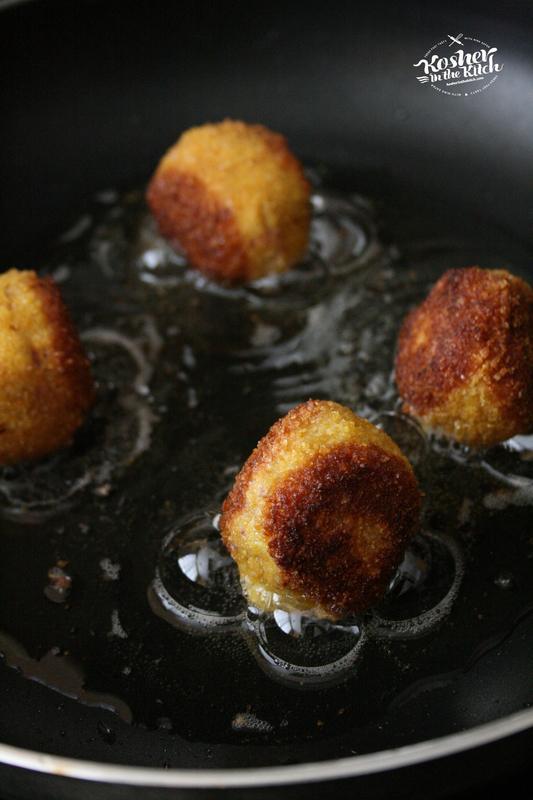 Dip balls in whisked eggs then coat in corn flake crumbs. Heat up a frying up with a small amount of canola oil and fry on all sides until browned. Flip matzo balls over so all sides are golden brown. 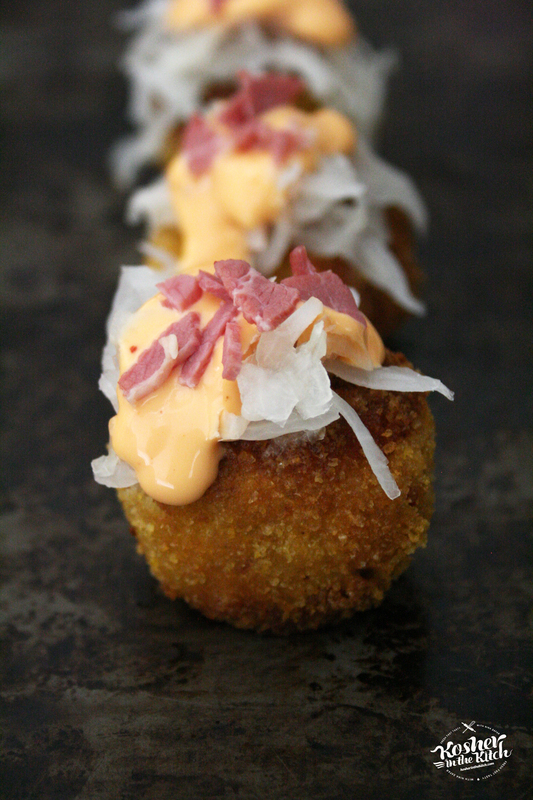 Serve with kraut, Russian dressing and remaining diced corned beef. ** Disclosure: This post is sponsored by Lipton Kosher. Lipton Kosher & Kosher in the Kitch are collaborating to bring you deliciously easy recipes using Lipton Matzo Ball Mix. These look delicious. May make for Thanksgiving. If so, How would you heat them up? Oh man, these look awesome! 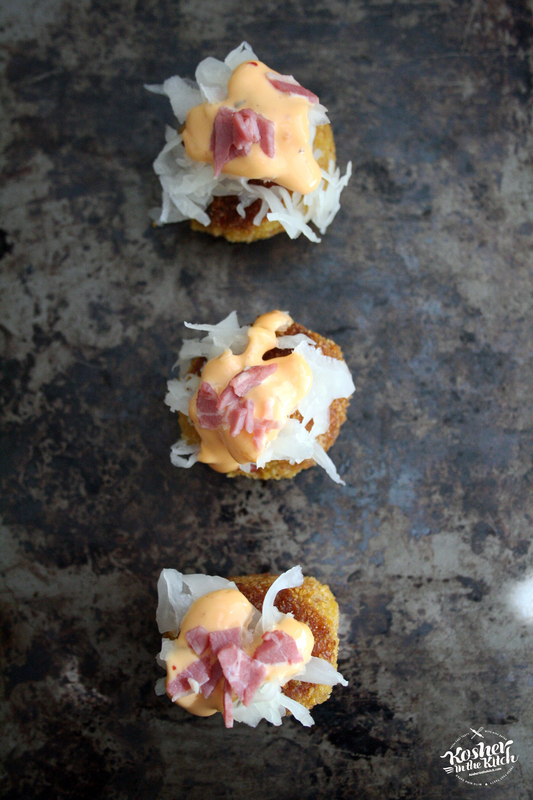 And luckily I have a brand new jar of Bubbies sauerkraut in the fridge just waiting to be made into these! Wow, so tasty! Any reason to use sauerkraut in a recipe and I’m sold! I used Cook’s Pantry sauerkraut, what kind do you prefer? Thanks for sharing!